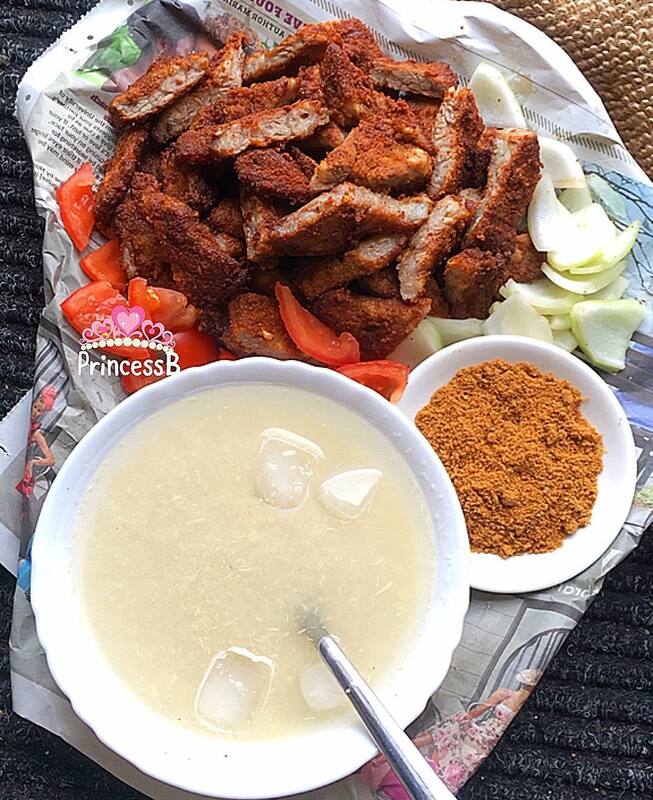 You can create suya with any of your favourite meats: lamb, pork etc, just pour the seasoning and you're good to go. It is practically a staple of the Nigerian diet and a national delicacy and here's how you can make the spicy treat in the comfort of your kitchen. Suya experts have their own unique blend of kuli kuli (groundnut/peanut butter deep fried till crunchy), ground ginger, pepper flakes, stock cubes and salt to come up with the Suya spice that keeps people hooked on the spicy snack we love called suya and now you can make it in the comfort of your home. 1. Soak the Suya sticks in cold water for at least 5 hours. This ensures that the sticks do not burn during the roasting of the Suya. 2. Cut the beef into very thin fillets. 3. If the fillets are long and large, cut them into small pieces such that when you thread them on the sticks, they will not flap too much. 4. Now thread the fillets of beef on the Suya sticks. 5. Put some groundnut (peanut) oil in a bowl, add a small quantity of salt and stir. Using a cooking brush, rub the groundnut (peanut) oil on the threaded fillets of beef. This is what helps the Suya spice stick to the meat so make sure you do not leave out any part of the meat. 6. In a wide dish, spread the suya spice and dab the threaded fillets of beef in the spice so that the beef takes up as much of the spice as possible. All the beef will be covered with the Suya spice when you are done. 7. Place all the now spiced beef in a flat plate, cover with a thin plastic film and leave to marinate for 1 hour. 2. Place the beef flat on the oven rack and put in the oven to roast. 3. After 15 - 20 minutes, flip the beef to roast the underside as well. The length of time you'll roast each side depends on how thick the fillets are. So total roasting time for both sides of the beef is 30 - 40 minutes. 4. Rub some of the remaining groundnut oil on both sides of the beef. Increase the oven temperature a bit and roast either side of the beef for 5 minutes each. Now you're ready to serve your delicious suya with chunks of onions and cabbage slices. Delicious!